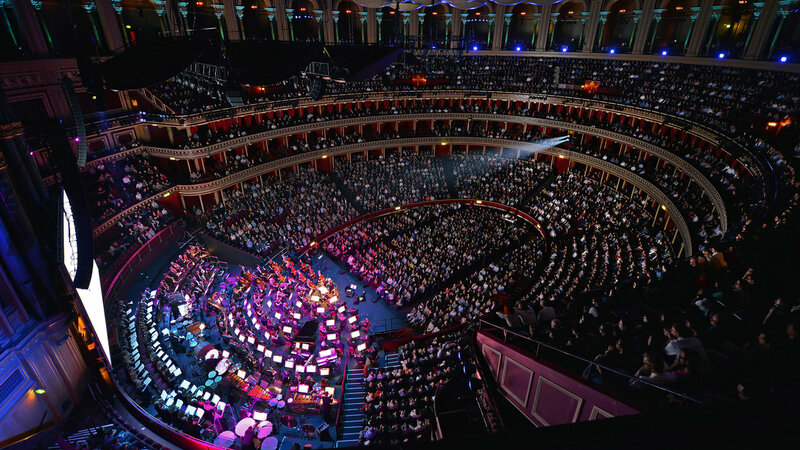 Steven Spielberg’s seminal science fiction masterpiece Close Encounters of the Third kind came to London’s Royal Albert Hall last night in the latest in the historic venue’s Film in Concert series. When approaching the magnificent hall to attend this concert, one can almost feel like they are themselves about to have a close encounter with a spacecraft. The gigantic cylindrical amphitheatre is decorated with arches upon arches all illuminated against the dark London sky with an appearance almost resembling an otherworldly spaceship. With it’s visual similarity to the ships in the film you’d be hard-pressed to find a more appropriate setting to enjoy this archetypal film about first-contact. Before the concert began it’d be safe to assume that even those audience members who’ve not seen the film before may already be familiar with one of it’s key components. John Williams’ legendary score for this film has after all been referenced and parodied in a variety of different mediums making the music almost more famous than the film itself. Williams, being the master of the musical leitmotif in cinema, has a career filled to the brim with instantly recognisable and hummable tunes. Close Encounters of the Third kind, however, has the distinguished honour of being the composer’s favourite score. When the concert began the film played to a hushed audience whose challenge for the evening was to ping-pong their eyes between the musicians and the film. John William’s soundtrack was performed expertly by the Royal Philharmonic Concert Orchestra and English Chamber Choir and conducted by Ernst Van Tiel whilst Spielberg’s film was projected directly above the stage. This arrangement proved a delightful challenge as each time the film would reach a dramatic narrative point the audience is forgiven for actually looking away from the screen to watch the exquisitely skilled orchestra simmering their instruments in unison to add all necessary tension and splendour to the film. If there is a criticism to be made of the evening it’s that Spielberg’s direction early in the film is to build tension and suspense through silence leaving the orchestra with not so much to do in the first act. However in 1977 when the film was being made neither Spielberg nor Williams could have possibly known that hundreds of people would be watching the film play as the score was being performed live in front of it thus we can surely forgive them. In the film, when the aliens make contact with the humans they instil in the protagonists a musical method of communication. The fact that that music is the medium that provides the narrative bridge between the civilisations provided this concert evening with an unexpected level of gravitas. After all, the otherworlders in the film were reaching out to the humans with the exact same musical notes that the orchestra was reaching out to us in the audience with. The Royal Philharmonic Concert Orchestra’s greatest achievement for the night came to us with the arrival of the film’s denouement. The score increased in scale and tempo minute by minute in-time with the blinding light-show of Spielberg’s direction and by the time the climax of the film had happened one felt as if they had truly been part of something special. The next concerts in the Films in Concert series will be Gladiator, Jurassic Park, The English Patient and Harry Potter and The Prisoner of Azkaban. Get your tickets now.